This is a wonderful recipe that came across my Facebook acct. 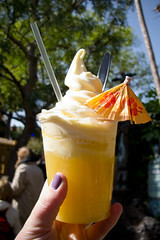 It is for the world famous “Dole whip” from Walt Disney World. I wish I could give credit to whoever originated this one. However, their name appears lost in the world of social media. If you have never had the opportunity to enjoy one of these from the parks….you really need to give it a try. It comes along right at the start of summer/spring. For those familure with these wonderful frozen treats…enjoy. I tried it and while it is not just like the original…it does bring back some fond memories. Pour into two 1 – quart freezer zipped bags.